The RACK-Zero Air generators produce dry and hydrocarbon-free air, using air from oil-free compressors, thus avoiding the need to use traditional bottles that are often complex to change. Designed with safety and convenience in mind, this system will eliminating the need for inconvenient high pressure gas cylinders. This complete turnkey system is engineered with the highest quality components, is easy to install and requires only minimal annual maintenance.The ergonomic, compact and silent design makes the RACK-Zero Air series the ideal solution for the following analytical applications. 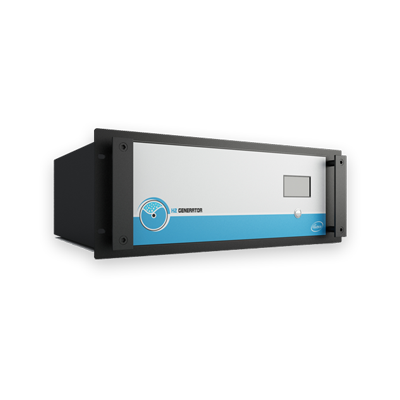 The reduction of hydrocarbons, including methane to < 0.05 ppm decreases the background noise level and gives the baseline much better stability, considerably increasing detector sensitivity and ensuring precise analytical results. A constant, uninterrupted gas supply of guaranteed purity eliminates interruptions of analyses to change cylinders and reduces the amount of instrument re-calibrations required. The unit only requires connection to a suitable socket and to external source of compressed air. The investment can be paid back in less than one year. Zero air produced at low pressure and ambient temperature removes the need for high pressure cylinders.